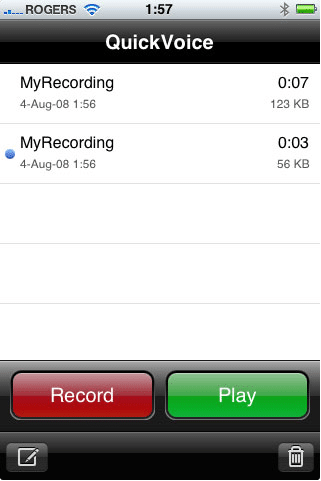 QuickVoice is the most popular featured voice recorder that is recommended for iPhone and iPad users. It is the best for recording Skype calls and other recordable voices passed through your iPhone. This is an application that features voice reminders, audio stickies, and audio editor. Records Skype conversation, voice memos, reminders, to do list etc. You can also be able to transfer your recordings from your iPhone to Mac PC without any inconveniences. If you would wish to capture ideas, conversations, lectures as well as seminars without having to type anything, then this is the application to go for. Best news is that you can have a built-in ringtone that will remind you of your voice recordings. This is absolutely free. You can be able to multitask while the recording is taking place. The end user can also produce his or her custom made ringtone easily. Quick voice is normally integrated to work with iTunes. Just a click away automatically turns your recordings to MP3 and later adds it to iTunes Library listing. This is great for archiving and for also transferring your records to digital players such as iPods. This is an application that is ideal for professional or home use. Transferring many files to a different end user can sometimes become difficult and will often require patience. You can be able to send voice mails of up to 20 MBS and each mail should not be over 5MB. Otherwise you won`t be able to do much with it. Synchronizing your records to the computer can sometimes take time and can also be a bit slow. 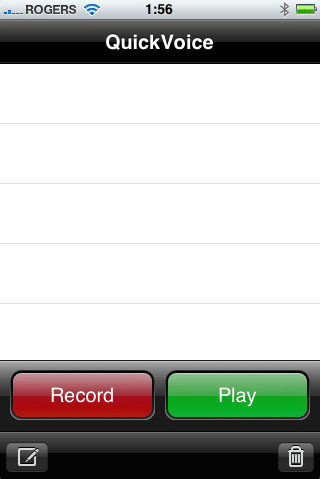 To begin with, the recording button is well indicated and once you click on it, the recording startsasap. The best thing with this application is the fact that it provides the two important buttons, PAUSE and RESUME. Many basic recorders lacks these features which are useful when recording important files. The downside of this application is on its usability on iPhone. OuickVoice feels misplaced on the iPhone. Its UI design is somehow below the standards of an iPhone hence looks inferior when in use. If for example you want to edit, delete or play a recording, you have to first tap on it then you can select the command button at the top of the screen. Now, the confusion arises when the same blue dot is used to highlight the currently selected item. Remember, a blue dot in an iPhone is used to indicate an unread/new/unheard item. For effective use of this software, it is of importance to configure this tool. This will ensure that you get more out of this application. To start with, this app has an audio level bar. If for instance you are a journalist, this app will help you ensure the soundbite is excellent with no modulation. Additionally, QuickVoice provides you with a free sync utility program that helps you transfer your Skype recordings straight to your computer/iTunes. However, to get this tool you will have to send an email to the specific company. For all your Skype recordings with Quick Voice recorder, you have to manually start to record calls from your iPhone or iPad. This can be able to record for you unlimited online conversations. The conversation can be able to take place in the background as you run QuickVoice on the front end. With this application, there are no limitations to making Skype calls on your iPad or iPhone.